EdgeLink has earned Inavero's Best of Staffing® Client Satisfaction Award and Talent Diamond Award after winning the Best of Staffing® Talent Award at least five years in a row. The whole reason we started Our year over year track record shows that service is our greatest priority and our customers and candidates mean more to us than anything. Being recognized yet again by Inavero is a true honor. EdgeLink, a leading employment agency in the technology industry, announced last week they have earned Inavero’s Best of Staffing® Client Satisfaction Award and Talent Diamond Award after winning the Best of Staffing® Talent Award at least five years in a row for providing superior service to job seekers. Presented in partnership with CareerBuilder, Inavero’s Best of Staffing® winners have proven to be industry leaders in service quality based completely on the ratings given to them by their clients and the permanent and temporary employees they’ve helped find jobs. On average, clients of winning agencies are nearly three times more likely to be completely satisfied and talent of winning agencies are 50% more likely to be completely satisfied with the services provided compared to those working with non-winning agencies. Award winners make up less than two percent of all staffing agencies in the U.S. and Canada who earned the Best of Staffing® Award for service excellence. Focused on helping to connect people with the right jobs to further their career, EdgeLink received satisfaction scores of 9 or 10 out of 10 from 67.3 percent of their placed job candidates and clients, significantly higher than the industry’s average of 49 percent. 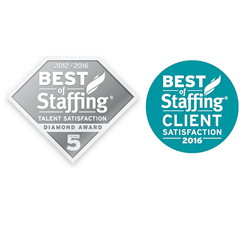 With fewer than 2% of all staffing agencies in U.S. and Canada earning the Best of Staffing® Award, just 22% of the 2016 Best of Staffing® winners earned the Diamond Award distinction. The winners of this award truly stand out for exceeding client expectations. EdgeLink is a technology staffing firm that recruits the best mid-to-executive level technical professionals on a contract, contract-to-hire and direct-hire basis. Headquartered in Portland, Oregon, EdgeLink works with start-ups to Fortune 100 companies throughout the country. Their knowledge of the technology industry allows them to take a personalized, targeted and consultative approach to match the right candidate with the right company.